Our research team knows how important it is for a runner to find the perfect professional running shoes, which are able to give just the right amount of stability and support, without sacrificing durability and traction, especially for long-distance races – marathons and half marathons. That’s why we decided to find out what modern shoe brands are the best for long-distance running, and which of the recently released models we can recommend to our readers with a clear conscience. Check out our list of TOP 11 Best Long Distance & Marathon Shoes, their pros, cons, and short reviews in order to invest your money to the best advantage of your comfort, security, and performance. Which shoes are the best for running long miles? Nike Air Zoom Pegasus 34 is the answer! 34th iteration is probably the best professional running shoe ever. Besides, this is an ideal option for beginners who strive to win marathons in the near future. Why and how does Pegasus stand on the market during such a long time? They just work! They’re able to cope with long distances and daily workouts on roads, treadmills, and concrete, they are very lightweight yet durable, reduce sweating and heat buildup when running, providing the runner with maximum comfort and support without blistering and irritation. Their features a fresh breaking external design: the upper is made of FLYMESH material, which seamlessly wraps the foot, improves moisture management, without weighing a runner down. FLYWIRE cables on the sides integrate with the lace-up closure, giving a fluid ride and an adaptive fit. The midsole is nearly identical to the previous version of the shoe, it’s a blend of full-length CUSHLON foam, which produces a higher level of bounce and responsiveness, ZOOM AIR bags in the forefoot and heel areas, which double the cush effect and the removable anatomically shaped Fitsole insole on the inside. All that stands on the DURALON outsole, that makes these shoes super durable and flexible for the longest distances. Awesome traction on various surfaces. Gel Kayano has been a leading sneaker for men and women in the marathon running shoe community for many years. Moreover, it’s known as a great resolution for people with different feet and knees issues, who wanna run long distances. Gel Kayano 24 is deservingly in the top of our list, as it’s literally stuffed with numerous modern technologies, which make this sneaker perfect: FluidFit guarantees a truly customized glove-like fit, Dynamic DuoMax System (a new version of a traditional DuoMax), MetaClutch external heel counter for improved heel support, Guidance Trusstic System and Guidance Line Technology enhance gait efficiency. FlyteFoam Technology for exceptional bounce back and responsiveness without packing out, GEL Cushioning in the rearfoot and forefoot for smooth transitions through the gait cycle, FluidRide Technology also reduces the overall weight, and the Ortholite X-40 insole adds extra cushioning from the inside. With Gel Kayano 24, you’ll feel a huge difference in terms of comfort and support, cushioning and stability immediately since you put them on. Yes, these long-distance runners are rather pricey, however, they definitely worth that money. Help with bad knees, ACL injury, Plantar Fasciitis, overpronation, IT Band, flat feet, and other foot issues. Adidas Adizero Adios Boost 3.0 is one of the brightest Adizero and Boost series’ representatives, and it’s not only about its colorway and external design, but also about it wearing advantages and performance, especially when it comes to long distances like half marathon and even marathon. Built for endurance, these shoes will give you the tool to fly past other runners again and again, despite the weather conditions, surface, and distance. The upper of Adidas Adizero Adios Boost 3.0 allows the foot to be well-ventilated, cool, and dry, and the Coolever Mesh Lining improves the moisture management from the inside. Heel collar features the Geofit construction with memory foam that improves the fit and keeps the foot in. Energy-returning BOOST foam technology is super lightweight, so it doesn’t limit the movements of the wearer, and the TORSION SYSTEM gives you maximum stability, helps the foot to go through the gait cycle with ease. The outsole is made of CONTINENTAL RUBBER for durability, and the ADIWEAR RUBBER is strategically placed in the heel area to deliver perfect traction on dry and slick surfaces. Designed specifically for long-distance running. Looks cool and stylish, available in 4 colorways. Snug upper adapts to the movement of runner’s foot. The Brooks Adrenaline GTS 17 is a great long-distance running shoe, which was created to give marathon runners maximum stability, support, and comfort in their performance. This professional running shoe gives an opportunity to stay safe during the race without sacrificing even a small percent of your speed. This runner is a huge step forward in terms of stability, which is the greatest advantage of this sneaker, for sure. Featuring the innovative BioMoGo DNA foam technology, it’s properly cushioned but doesn’t feel cumbersome and heavy. With the Segmented Caterpillar Crash Pad, it doesn’t matter how the foot lands, you’ll get a smooth ride, and the progressive Diagonal Roll Bar provides smoother transitions from heel-to-toe. The Brooks Adrenaline GTS 17 is made of breathable Element Mesh material, which also supports the foot and fixes it in a secure position. If you’re a stability seeker, who needs a go-to shoe for long distance runs, search no more and purchase these amazing running sneakers from the famous brand. A slight rubbing is possible. Flyknit Racer is known not only as the best brand’s running shoes but also as the model, which works ideally both for women and for men. These unisex runners are so popular throughout the world that they hardly need any introduction. 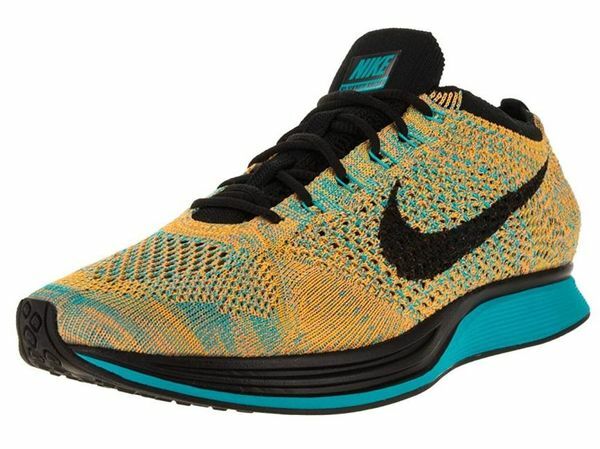 The Flyknit Racer offers a damn good external design: available in a countless variety of colorways from classic and monotonous to bright mixes of vibrant color schemes, it’s made of super breathable, stretchable and supportive Flyknit material, which looks and feels like a soft knitted sock. The Flywire technology helps to reduce the weight of the shoe, providing the adaptive, secure fit, and targeted support. The full-length Phylon midsole, made of compression-molded EVA foam make the cushioning ultra-responsive, and the forefoot Zoom Air unit ensures a plush feel while still keeping the shoe light and speedy. So, you can be sure that the Flyknit Racer will absorb all the shock and give a little response back to make you the winner of the race. Proper stability for bad knees. In case of daily use, the underfoot platform can lose its effectiveness quickly. Gel Nimbus 19 is a resolution for runners with knee problems. The ASICS FluidFit upper offers an odor-free breathable environment for your foot as well as no irritation or blisters thanks to its soft seamless construction. It fits like a glove and features the Heel Clutching System Technology – it provides improved support, creates adjusted heel fitting environment, stabilizes, secures, and gives extra comfort. High responsiveness of this shoe is reached thanks to the catchy combination of the full-length Fluid Ride midsole (it provides the ultimate combination of bounce back and cushioning properties with reduced weight and exceptional durability) with rearfoot and forefoot GEL Cushioning Systems (they attenuate shock during impact and toe-off phases, allowing movement in multiple directions). Nimbus 19 is built on the High Abrasion Rubber outsole with the strategically placed DuraSponge technology for flexibility and traction. Gel Nimbus 19 is definitely for you if you wanna keep your knees safe and do your best on another half-marathon. You will never go wrong with the Adidas Ultra Boost, as it is a perfect shoe for a perfect run – properly cushioned, lightweight, stable, and secure – what else do you need to do your best at a race? Especially since the style and fashion are also on point! Available in a huge variety of colorways and prints for any taste, the Ultra Boost deservingly is the best long distance running shoe for women. The upper of the sneaker is made of highly breathable and stretchable Primeknit material, which is covered with three-stripe overlays on the sides for a more stable fit, also, there’s a heel cage for improved rearfoot security. To reinforce moisture-managing abilities of the upper, on the inside, there’s mesh lining and a moisture-wicking insole. The unique full-length BOOST technology is probably the main reason to pick these running shoes. The midsole is comprised of 3,000 energy capsules (20% more than any other shoe), which keep every step charged with an endless supply of light, fast energy. Besides, it’s also incredibly stylish and super lightweight. Adidas’ famous TORSION system allows the forefoot and rearfoot to move independently and adapt to running surfaces, so the heel-to-toe transition is extremely smooth. Ultra Boost is an ideal companion for women, who wanna be the first both in the race and in the fashion top! Fashionable look and non-traditional design. The tongue is not movable. Boost foam compound is very lightweight. The external heel counter keeps the heel in place. Breathable Primeknit upper and mesh lining. The Nike Zoom Vaporfly 4% is one of the best professional running shoes. These sneakers actually are the redesigned version of the famous Vaporfly Elite, which was made to break the two-hour barrier for the 26.2-mile distance in 2017. So, what are these mysterious 4% all about? The thing is around 4% better for running economy than any other brand’s marathon shoes. Isn’t it a great investment in your performance? The upper of the shoe is rather minimalistic – it’s a single-layer seamless mesh and a single-piece overlay, which aim to deliver the best moisture management possible. Nike offers their relatively new ZoomX foam in the midsole. Labeled as a ‘revolution’, this technology promotes a more dynamic feel as it not only absorbs impact on landing, but it also projects the foot forward in expectation of the next stride, so it fairly is the most responsive and energy-returning EVA foam on the market today. Also, this runner features a full-length curved carbon plate embedded beneath the midsole. Summing up, the cushioning system provides energy return of up to 85 %. The minimalist style is kept in the outsole design as well. It’s made of lightweight foam rubber with pentagon patterns for durable traction and flexibility. Zoom Vaporfly 4% isn’t an invention – it just puts together all the best existing technologies to offer you the best running performance. Don’t mind to spend a pretty penny? Hurry up – they sell as fast as they run. Breathability and lightweight nature of the upper. Secure heel cup worked prevents foot slippage. A responsive midsole makes you 4% faster and more efficient. A stiff bumper for toe protection. Recommended for runners with neutral pronation. Built without typical Flywire cables. The upper construction may seem overly thin. A single width-profile (D – Medium for men, D – Wide for women). The reasonable price tag of the New Balance Fresh Foam Zante v3 is not the only thing, which attracts lots of long-distance runners throughout the world. Apart from its affordability, this shoe can boast of stiff, fast, and stable ride, secure and comfy fit, top quality and design. The streamlined sleek upper is made of flexible and breathable mesh material with bigger perforations in the forefoot area. The inner sleeve guarantees a glove-like feel, and soft collar and tongue provide maximum padding to the ankle. The traditional new Balance’s Fresh Foam is updated in this model – now it’s modified with new hexagon convex shapes, which give more firmness, responsiveness, and create a smooth heel to toe transition. Another cool feature is a midfoot saddle, aimed to give more life and structure to the upper. The sneaker stands on the unique New Balance Zante outsole, which helps with more stability and efficiency due to its large mass of hexagons in varying sizes with a little variation. And the strategically placed blown rubber and carbon rubber work together to make the shoe performance long-lasting. Versatile (good for tempo runs, shorter distance sprint drills, marathons, long distance workouts). Good traction, even on wet surfaces. Stylish design with multiple reflective details. The Saucony Triumph ISO 3 is built to deliver a smooth and comfortable ride to the neutral runners, who wanna cope with long distances. Comparing with its predecessor, Saucony Triumph ISO 3 has lots of great updates and the new engineered mesh with enhanced adaptability and ventilation is one of them. This material is more flexible as well and has bigger holes for the sake of breathability and moisture management. Also, the brand has removed most of the thick overlays and replaced them with FlexFilm thinner versions, and the supportive inner sleeve hugs the foot in wraparound luxurious comfort. Consistent cushioning of the sneaker is guaranteed by a full-length Everun top sole, placed just beneath the insole for an excellent spring. However, the main midsole’s foam is the SSL EVA – it is adequately responsive and durable enough to withstand the most long-lasting running sessions. The outsole of the 3rd Saucony Triumph has huge flex grooves (much deeper than in the previous versions), and the rubber areas between the grooves are also slightly wider, that gives an enhanced ground contact. Durability and traction are on point thanks to the blend of IBR+ in the forefoot and midfoot, and XT-900 rubber in the heel area and tips of the forefoot. Roomy toe box for natural toe-splaying. Everun heel insert gives optimal heel cushioning for heavy heel strikers and heavy-framed runners. Plush platform and responsive midsole. Versatility (good for tempo runs and slow long-distance sessions). The right amount of support. The lace-up closure may press on the foot because of the thin tongue. Wanna double your long-distance training and marathon races? DynaFlyte 2 knows exactly what you’re looking for. Lightweight, comfortable and supportive shoe that offers an adaptive gender-specific fit and looks really trendy – what else are you dreaming of? The ADAPT MESH upper technology is aimed to provide a secure and distraction-free fit. Its seamless construction and the ASICS discrete eyelets minimize the risk of friction and irritation, and the breathable pores keep your feet dry, cool, and odor-free even after a very long-distance race. FLYTEFOAM midsole technology is 55% lighter than the standard EVA foams, so with the DynaFlyte 2, you won’t sacrifice the lightweight for an exceptional bounce back and responsiveness. Moreover, this running sneaker gives the extra dose of cushioning thanks to the removable ORTHOLITE X-40 sock liner, which is also made up of an anti-bacterial material that keeps the runner’s foot healthy. Another cool feature of the DynaFlyte 2 is the AHAR outsole. It provides enhanced durability and grip on various surfaces. Well-constructed breathable and supportive upper. No break-in period; no skin irritation and blisters. Removable insole (your favorite orthotics can be accommodated). Independently placed eyelets disperse the lace tension. What kind of shoes do marathon runners wear? Relying on our research, we’ve concluded that famous marathon runners vary widely in the types of shoes they prefer to wear for their races. However, the main criterion, chosen by most of them, was LIGHTWEIGHT. SUPPORT was the second essential for the majority of marathoners – they explain that it keeps their feet in a neutral position (instead of pronating), so they can be sure that they’re unlikely to get the injury. CUSHIONING and GRIP were also mentioned by almost all of the professional runners: “Every time I hit the ground, I want the shoe to protect my knees and joints from that huge impact, but also I want them to give me a push and help run even faster”. What are the best Nike running shoes for long distance? Nike Air Zoom Pegasus 34 deservingly is the best Nike running shoes for long distance ever. It’s like a marathon classics that never gets old. The company does its best to keep this model maximally up-to-date, constantly renewing it and adjusting new technologies and designs. However, Nike Flyknit Racer and Nike Zoom Vaporfly 4% are very worthy substitutes to the old good Pegasus, and lots of runners opt for these two options when choosing their marathon running shoes. So, you definitely should consider all three models and choose the one to your taste – all three are equally efficient and high-quality but have different nature. If you’re a representative of the rare breed of long-distance runners, the best running shoes are the first thing your feet deserve! So, never skimp on them! All our team tried to make the most extended list of the best long distance running shoes. However, Brooks and Saucony brands also have several great models, which can offer the same quality and comfort as the bigger-name brands. It’s hard to choose one best sneaker from the list, so we placed our 3 leaders at the top. They’re Nike Air Zoom Pegasus 34, ASICS Gel Kayano 24, and Adidas Adizero Adios Boost 3.0. Break the records and treat your feet with the best long-distance running shoes ever!